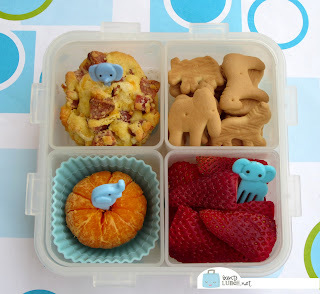 BentoLunch.net - What's for lunch at our house: Simple Elephant Bento for the Boy! Simple Elephant Bento for the Boy! After a weekend that involved camping with the Girl Scouts, my inspiration for a lunch today was about nil. So I dipped into the freezer stash and the fridge stash and grabbed a few elephant picks for my elephant loving boy, and called it a day! Ben has a corndog muffin, which is the last of those, a cutie orange, sliced strawberries and animal crackers (with the elephant one placed predominantly at the top). I packed it in a 4-square Lock & Lock box, added some of our elephant picks to make it cuter, included some Chobani Champions yogurt, a water bottle, and it's lunch! Looks like a tasty lunch to us! Thanks for including our Champions in the line up. I always love seeing the elephants!